It is the 1950’s, the world of the Cold War. Communism is the great enemy and the superheroes of the Golden Age are not seen with sparkling eyes of yesteryear, but rather are met with disdain and contempt. 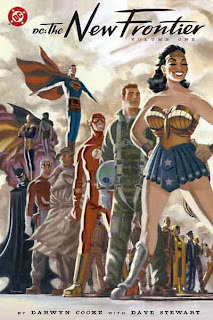 Some supers (Superman, Batman and Wonder Woman) have survived the anti-superhero sentiment, working for the government to crush Communism and establish a democracy throughout the continents. Other superheroes are in the wings, some just young and others just unaware. The world is full of change: racial divides, civil rights, the space race, the Korean Conflict, communism, McCarthyism, and politics all intertwine in this boiling maelstrom called DC: THE NEW FRONTIER. Other forces are also at work. The mysterious Center is wreaking havoc and old and new heroes must form alliances to save all from this otherworldly creature bent on destruction. Cooke carefully weaves an episodic yarn full of character back-story and motivation, giving us a heavy dose of human and superhuman inadequacies, self-doubt, anger, confusion and ultimately heroism. It’s brutal at times, seeing how our society has acted, and yet the ideal of the hero comes through proudly, confidently, ending with a sense of understanding, calmness and great change. Cooke’s highly stylized, square-fingered art is reminiscent of many old school comic creators, in an obvious hat tip to these greats. It works; it works very well. This story has been called cinematic due mostly to his use of three horizontal panels on most pages, a technique that is very effective. Flash is forced to don the red and run to save his girl. Cooke uses his art to address hard-hitting themes. Cooke shows the role of government in the superhero story. There is cursing and blood, smoking and drinking, and all kinds of political nightmares going on. All of it is appropriate to the story and seems natural, but it is heavy and best suited for high school aged students. The heavy racial and political themes expressed in THE NEW FRONTIER are obviously important to our history and our current cultural identity. The tumultuous times changed our lives forever. High school students react well to authenticity and real life and they would respond well to an exploration of those times through the use of this comic. There are problems, however, what with the cursing, smoking and whatnot. The teacher must consider his or her school board, school culture, and the larger community before introducing THE NEW FRONTIER. 2005 Eisner Award: Best Limited Series, Best Coloring and Best Publication Design. 2005 Harvey Award: Best Artist, Best Colorist, and Best Continuing or Limited Series. The series is also available in a 464-page, oversized hardcover, which sells for $75. This is not an official designation of mine. Typically, a “Recommended with Reservations” would be enough. However, Cooke’s work is important and beautiful and worthy of study. So I melded two recommendations into one in hopes that teachers would consider the work and determine if it is right for their high school or college classroom. 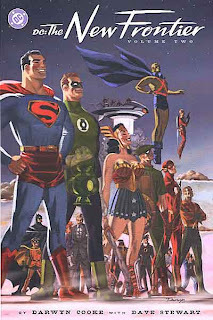 I have reservations because DC: THE NEW FRONTIER is not for every class, not for every school. It might be scary, even controversial for some communities to look at the world in such a way. My reservations, however, are not based on the literary value of the work. That is, in my opinion, stable. It is the secondary issues that give rise to concern. This story is important to history and to our understanding of ourselves. It is about human nature, fear, patriotism, advocacy, and change. DC: THE NEW FRONTIER cuts to the chase, sometimes to the quick, and then dresses the wound with a good, old-fashioned hero bandage. I loved it. I agree with your review on this completely. I could see some history classes using this as a method to talk about issues in America during this time frame. It would not be appropriate for every school. It is a great piece of historical fiction. Excellent review. I loved the book and hear that Darwin Cooke may be revisiting this "universe" soon.